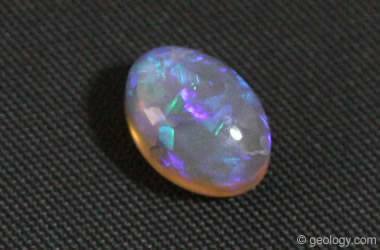 Crystal Opal: The stone shown here is a crystal opal with blue to violet play-of-color. It is a calibrated 8 x 6 millimeter stone cut from material mined at Lightning Ridge, Australia. "Crystal opal" is a term used for a transparent to translucent opal material that has a play-of-color within the stone. Crystal opals are often faceted to produce gems that have internal play-of-color and fire exiting from the facets. Photos shown here are a crystal opal cabochon with blue to violet play-of-color. It is a calibrated 8 x 6 millimeter stone cut from material mined at Lightning Ridge, Australia. Also a faceted Ethiopian crystal opal with a water-clear body color and internal play-of-color. It is four millimeters across. 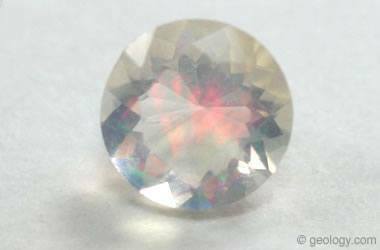 Faceted Crystal Opal: The stone shown here is an Ethiopian crystal opal with water-clear body colors and internal play-of-color. It is four millimeters across.